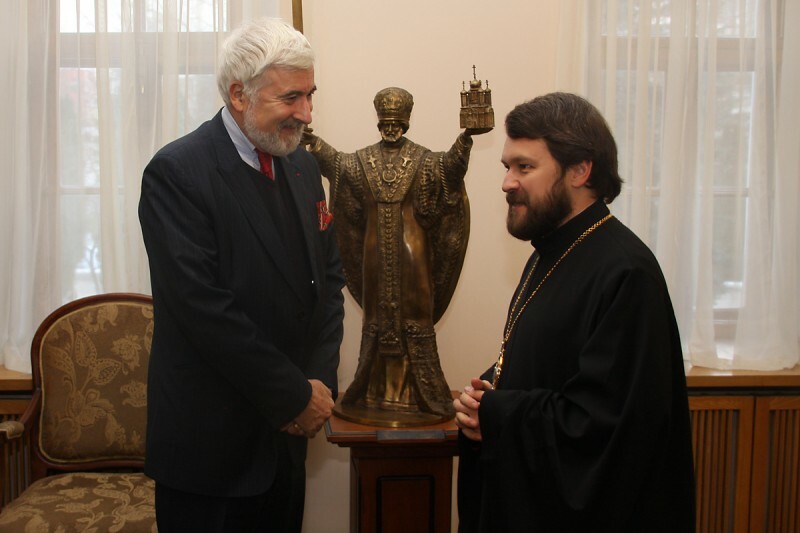 On 3 December 2012, at the Moscow Patriarchate’s Department for External Church Relations, the DECR chairman, Metropolitan Hilarion of Volokolamsk, met with H.E. Mr. Jean de Gliniasti, Ambassador Extraordinary and Plenipotentiary of the French Republic to the Russian Federation. Participating in the meeting were also archpriest Sergiy Zvonarev, DECR secretary for far abroad countries; Mr. Miguel Palacio, a DECR staff member; and Mr. Nicolas de Lacoste, first counselor of the French embassy. Metropolitan Hilarion warmly greeted the French diplomat and told him about the inter-religious situation in Russia and the relationships between the Moscow Patriarchate and the Roman Catholic Church. The participants in the meeting discussed the role of traditional moral values in the European Union countries and the situation of Christian communities in the Middle East and North Africa.